Munzee – Scavenger Hunt » Seasonal Munzee Point Update & International Peace Day Personals! Seasonal Munzee Point Update & International Peace Day Personals! We’re excited to announce a point increase on Seasonal Munzees, which will go into effect at 00:01 MHQ on September 22! This cycle will be continuous, but you can only capture each stage of the munzee once (i.e. if you capture the Fall stage, you cannot capture the Fall stage a year later). Previously Seasonal Munzees have only been available in MunzPaks, which means there haven’t been a large quantity of these deployed around the world. We want to change that! We have some cool future plans for Seasonal Munzees, but we need more of them deployed before we can reveal those ideas. Think you can help us grow the Seasonal map? For the first time ever we’ve now added Seasonal Packs for sale in the Freeze Tag Online Store. For a limited time you’ll get 10 pre-coded Seasonal Munzee stickers for the discounted price of $10. 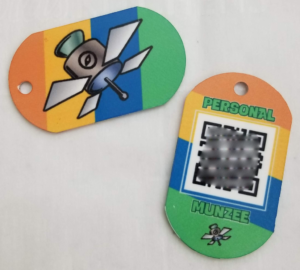 In other news, today is International Peace Day and to celebrate we have a new Personal Munzee Tag for sale in the online store. In our location-based gaming world, what’s more peaceful than Coexisting? Be on the lookout for more point increases as we near the launch of Munzee 4.0. Thanks for your continued support and Munzee on! This entry was posted in ANNOUNCEMENTS, GAMEPLAY, Munzee Events, NEWS, PLAYERS, STORE, UPDATES and tagged 21st century scavenger hunt, 4.0, android, app, badges, capture, clan, deploy, event, EVENTS, eventzee, exercise, friends, fun, geocaching, GPS, health, hide and seek, international, munzee, munzee 4, peace day, personal tag, player, point update, ruby, Scatter, scavenger hunt, Seasonal, Seasonal Munzee, special, technology, tour, travel, trip, update, virtual on September 21, 2018 by Team Munzee.